Love and Accountability: It All Begins With You! Love and Accountability – Happy Valentines Day! It’s easy to want to blame or fault others when certain aspects of our lives aren’t going the way we want, especially when it comes to love and accountability. And yet few people embrace the concept that we are 100% responsible for the results we attain in our lives. This includes our thoughts, actions, and emotional well being. Accountability begins when we take 100% responsibility for every aspect of our lives … accountability begins with you! So today being Valentine’s Day, I thought I would share a few thoughts and ideas about the sometimes complex, often misunderstood, and misinterpreted, subject of … love … love and accountability. You don’t feel as much love as you would like: Walkover to the mirror and ask the person that you see if you truly love them? Yes, with all your blemishes, scars, mistakes, not so great decisions, and anything else about you and your past that was the result of being a human being. Please don’t try this one at work! You wish you had more love in your life: pull out a paper and pen and make a list of the top 10 things you love about yourself? Don’t laugh it may be harder than you think! You think you aren’t getting the love you deserve: ask yourself if you are giving out as much love as you want or expect in return. You believe the love in your relationship is waning: ask yourself if you are still giving as much love to your partner as the day you proclaimed your love to them or the day you fell in love. You are without the love of your life: repeat #1 followed by #2 each day for the next 2 weeks and watch what happens in your life, be careful you might not be ready for it!. In the business world, it’s easy to talk about accountability and holding others accountable when it comes to goals, to-do lists, quotas, or deadlines, if we want to be an authentic leader. 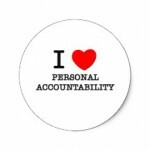 We need to apply the principles of accountability in our personal lives as well. Especially, when it comes to love and accountability and the relationship we have with ourselves … which is where it all starts! The goods news is that you are never alone … you always have yourself. Happy Valentines Day To You and Yours Yourself! PreviousPrevious post:The Values ParadoxNextNext post:ALL IN – Change Your Commitments, Change Your Life!